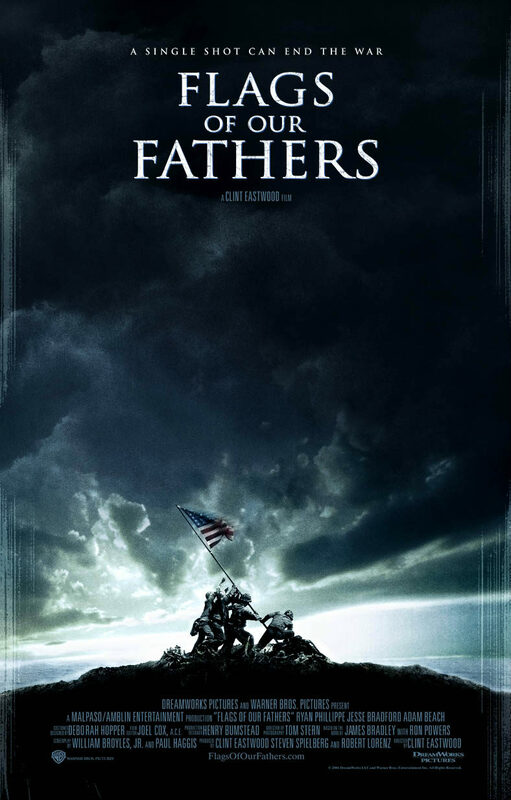 Flags of Our Fathers is a 2006 American war film directed by Clint Eastwood based on the book of the same name written by James Bradley and Ron Powers. The film is about the 1945 Battle of Iwo Jima, the five Marines and one Navy Corpsman who were involved in raising the flag on Iwo Jima. The font used for the film title in the poster is Trajan. American type designer Carol Twombly designed Trajan and the typeface was influenced by the style of carved letters produced by the Romans during the first century AD. Twombly completed the design, adding numerals and punctuation, as well as a bolder version to allow for text emphasis. In addition to Flags of Our Fathers, Trajan typeface is also used in the following logos, movie posters or album covers etc., including: A Beautiful Mind, Titanic, Minority Report, Yankee Candle Logo, Lincoln, Batman Arkham Origins, Quiz Show, Americano, Bridge to Terabithia, Assassin’s Creed, City of Angels, Face of Mankind, Fireproof, Courageous, Black Swan.